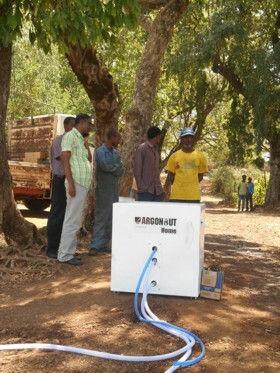 An Argonaut Home water purification unit, developed with the help of WIA, set up on the banks of the Blue Nile, in Ethiopia, at Bahir Dar, the capital of the Amhara Region, in April 2016. An introduction to the Water Initiative for Africa by HIH Prince Ermias: The Water Initiative for Africa, working with its partners, has developed a unique series of water purification units ? Argonaut series ç¨©ch totally eliminates 100% of all biological contaminants (bacteriological and viral) in water. Its first units (all made in the US) are now deployed in Ethiopia, and the systems have been trialed in the US, Australia, Thailand, Indonesia, and Ethiopia. In August 2011, we began this new initiative to bring pure drinking water to the People of Africa, specifically using low-cost technology which requires little or no maintenance, no filter changes, very little power, and which is very easily transportable. This we have achieved, in partnership with Argonaut Water. There are already many outstanding charitable aid activities working toward this objective. We chose to undertake this effort ? Water Initiative for Africa (WIA) ?ause we have been able to participate in the development of unique, low-cost new technologies capable of rapidly transforming life for millions of people, not just in response to emergency situations, but as a permanent building block for social development. We offer these new technologies for all. The WIA will work not only on its own projects, but with all other aid agencies, to achieve Africa? renaissance. As well, the WIA has evolved to act as a resource for water strategies for Africa, and, on October 30, 2015, co-sponsored a major conference on Capitol Hill, in Washington, DC, on strategic issues related to the Eastern Mediterranean, Red Sea, and Nile areas. I was delighted to have been able to Chair that event, and to participate in the subsequent publication in May 2016 of a major study, Rise of the RedMed: How the Mediterranean-Red Sea Nexus is Resuming its Strategic Centrality. The WIA contribution was to talk about Nile water use. 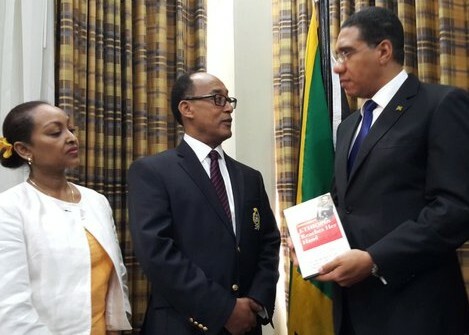 Their Imperial Highnesses Princess Saba and Prince Ermias Sahle-Selassie Haile-Selassie meeting with Jamaican Prime Minister Andrew Holness in Kingston, in April 2016, during their Highnesses visit commemorating the State Visit of HIM Emperor Haile Selassie I 50 years earlier. Water is the basic resource vital to all people, and the logistics of water are the underpinning of all of a society?chitecture. Most of Africa lacks any coherent water infrastructure; large areas have no water infrastructure at all, save a few wells. Yet we wonder at the lack of economic progress in many areas of the Continent. Generous souls and tireless charity organizations around the world have for generations responded with compassion to the desperate plight of the African People, and yet the suffering, disease, and seemingly endemic inability of the citizens of this diverse continent to escape from the punishing natural cycles continues. It is time for us to confront the reality that the basic underpinning of all African problems is its lack of safe, potable water. Aid to treat disease, and to provide emergency shipments of food, is an understandable reaction to the symptoms of crisis, but it does not address the systemic causes of a society?rsistent suffering. More than half the people of Africa lack access to safe drinking water. Moreover, in emergency situations, the ready availability of pure water can make the delivery of food aid more practicable, rapid, and effective, given that water can be used to reconstitute dehydrated food packs to as much as six times their volume. Without clean water, there is no foundational building block in a society. It is the first requirement for health; it is the basis of ensuring nutritional food and hydration, without which education cannot take root. Absent these factors, stable and productive society is scarcely possible. The World Health Organization, and such movements as The Water Project, have highlighted this concern, noting that, around the world, nearly a billion people do not have safe water to drink; that a child dies every 15 seconds from a lack of clean water; that 115 people die every hour from diseases linked to poor sanitation, poor hygiene, and contaminated water; one in four children who die before age five worldwide, die of a water related disease, a proportion which is much higher in Africa; and that water-related illness kills more people each year than wars and conflict. In developing countries, about 80 percent of illnesses are linked to poor water and sanitation conditions. Even these statistics do not truly represent the ongoing health and productivity costs of impure water. The Millennium Development Goals for water and sanitation showed how high a priority this is for the African states themselves, and yet some 340-million people in Africa remain without safe drinking water, and only 26 out of 55 countries on the Continent are expected to reach the MDG water targets by 2015. Some 580-million people lack adequate sanitation facilities in Africa, and only six countries achieved the MDG sanitation targets by 2015. The African Ministers?ncil on Water (AMCOW) was created to help resolve this crisis. However, the reality is that even the ambitious goal of giving people access to water in relatively convenient forms does not truly address the need to ensure that the water standard itself can be met. Until now, we have lacked appropriate and affordable technologies to address this challenge. I have worked for many years as President of the Crown Council of Ethiopia to help alleviate suffering in Africa, and particularly in my Ethiopian homeland. At the same time, in my capacity as a Senior Fellow of the worldwide International Strategic Studies Association (ISSA), I have participated in research and planning efforts to understand and address issues challenging human security, specifically promoting the concerns of Africa and Africans. Today, the world relies more and more on Africa for energy and resources, and Africa holds the potential to provide the world with the next major economic stimulus. As vital as it is as the global resource for energy and minerals, Africa cannot play its potential role unless it can transform its population from one challenged by chronic health issues, into societies which are healthy and productive. Recognizing this, with the ISSA, we have been able to understand and develop a series of new technologies which we envisaged to be created into systems which could sustainably deliver water purified to the highest levels possible in the world, and which could work under the most rigorous conditions. We ?t is, the Ethiopian Crown and ISSA ç¯²ked with a trusted teaming partner, Argonaut Water, Inc., to take these technologies and create low-cost, high-durability, low-maintenance systems which could work throughout Africa from family level to village level and above. The worldwide group which supports the causes and charities of the Ethiopian Crown ? International Society for the Imperial Ethiopian Orders è¡³ joined us to help bring these new capabilities to the places they are needed, in Africa. We recognize, in undertaking this initiative, that valuable work is already being done on digging wells, and building water delivery and sanitation systems, by a number of outstanding charities and non-governmental organizations, as well as by a number of international aid agencies and governments. It was specifically so that we could add to the work which these bodies are doing that we chose the path we did to provide water purification and self-sustaining desalination capabilities for coastal communities. These are the capabilities which will start to transform the health of Africa. Moreover, we are aware that we cannot address the needs of the Continent at a single stroke. As a result, we will begin our fundraising and efforts on the ground to assist the People of Ethiopia, and other African societies as threats and opportunities arise. Of course we are aware of the current famine and refugee plight in the Horn of Africa, and in some respects we feel that we are well-placed with our technologies to assist there, because our systems include solar-powered sea-water desalination systems, apart from our ability to transform contaminated ground water and river and lake waters. Zero reliance, if necessary, on diesel fuel, using new-generation solar power systems and new-generation batteries where necessary. What makes this initiative unique? The Water Initiative for Africa (WIA) is not designed to replace the valuable work undertaken by a number of other initiatives, both government, inter-governmental, and private, to provide water for African communities. Rather, through the technologies and understandings of our team, it is designed to make some of those other initiatives even more effective, while at the same time addressing a range of needs which have until now been neglected. The WIA has unique technology and systems, developed with Argonaut Water, Inc. to meet special criteria set out by the International Strategic Studies Association (ISSA) after decades of study. Argonaut Water then began combining the newest technologies in water filtration with the latest advances in solar power generation and energy storage, and ? in other systems ?rying rugged manual controls with the new filtration technologies, to create a series of low-cost, high-performance, easy-to-use, low-maintenance, rugged systems which can be easily deployed to areas of need. (d) Solar-derived electrical power generation to additionally support lighting and communications needs. It was a basic tenet of the new systems?elopment that they should not be required to be serviced on a regular basis, and neither should they be dependent on connection to a power grid, or the use of diesel generators. The systems were also designed to be free from components which would invoke export controls on high technology items. For village-level systems, the WIA?nual systems are also designed to be able to be used without training or maintenance, as well as to be extremely portable and rugged. As a result, the Argonaut systems can be moved quickly and cheaply to the areas of need, and be operational within minutes of their arrival at the point of need. What is significant is that the systems which can be rapidly put in place for urgent relief operations are designed to remain in the field for decades, providing the initial basis for a permanent infrastructure. The WIA is not geared to merely providing relief aid; it is designed to transform life and productivity for the long-term. Specifics of the systems? capabilities will be provided. Suffice it to say that the cost of a village-level unit ?able of producing some 5,000 US gallons (c19,000 liters) of purified water a day ç©¬l be around US$20,000. Such a system will require no ongoing filter changes or maintenance and should last, with daily use, from one to two decades. How does the WIA work? The International Society for the Imperial Ethiopian Orders (?rnational Society? US-registered 501(c)3 tax-exempt educational foundation is the primary supporter for the project. As a result, donations made to the WIA in the US can be made on a tax-exempt, charitable basis. All International Society involvement is on a pro bono basis. Argonaut Water will continue to act as the conceptual research organization for WIA, and it will utilize its strong existing political and governmental networks throughout Africa ç¨¥re it maintains a roving Ambassador, as well as numerous correspondents ?facilitate WIA?cess. The International Society for the Imperial Ethiopian Orders will essentially act as the contracting agency. It will procure the Argonaut systems and arrange for their delivery directly into the field, or to other international aid agencies. The Society is an organization of individuals around the world who have been honored over the years with Imperial Ethiopian recognition for their good works. The Society?am ? volunteers è¡³ agreed to act as the operational secretariat and management of the process. Argonaut Water, Inc., as the developer of the systems, works directly with the WIA, the International Society, and ISSA, to produce the systems, and to work on developing modifications and new systems to meet emerging needs. Working With Other Charities: The WIA does not see itself as working in competition with other charities, relief agencies, or government bodies which are helping to resolve the urgent, as well as the long-term, challenges facing Africa. WIA ?rating functionally through the International Society é³ willing, and keen, to provide its water and power systems to other aid organizations with no overhead or management fees. The objective is to make the entire process of relief and development in Africa more productive. The WIA is advised by a prestigious Honorary Board of Advisors, consisting of leaders from around the world who have committed to helping Africa. Their guidance, and their profile, should substantially assist in raising funds from the private sector and from governments and international aid agencies, and in ensuring that our systems go quickly to areas of greatest need. Dr Joan Vernikos, the former Head of Life Sciences at the US National Aeronautics and Space Agency (NASA). Dr Vernikos, who has already been working with Prince Ermias on African humanitarian issues, has extensive experience in sciences é®£luding water issues ç¨©ch are at the heart of the WIA. Dr Paul Scully-Power, Australia?rst astronaut (Space Shuttle, 1984) and renowned oceanographer and scientist. Dr Scully-Power, based in Washington, DC, is a key advisor on cyber security, but has also undertaken extensive scientific work related to the natural environment. Pamela von Gruber, the Executive Director of the International Strategic Studies Association, based in the Washington, DC, area, is ISSA?ad of Disaster and Emergency Response Studies, and chaired the US?ding Emergency Medical Service management board for some years. She has worked on Ethiopian and African strategic planning issues for several decades. Pamela is also the President and CEO of Argonaut Water. The Water Initiative for Africa is managed under the Presidency of Gregory R. Copley, the President of the worldwide International Strategic Studies Association (ISSA). He led the ISSA team in developing and defining the concepts for the WIA technologies. The WIA is in discussion with a number of potential corporate and private sponsors to assist in fulfilling the aims of the Initiative. HIH Prince Ermias and WIA President Gregory Copley would be pleased to discuss with corporations and others how sponsorship may be approached. We are all aware that this initiative offers the international community, and the African societies, the ability to transform Africa?oductivity for the lowest possible investment, and with the most rapid results. With water, all things blossom. HIH Prince Ermias Sahle-Selassie Haile-Selassie, The Water Initiative for Africa, PO Box 320608, Alexandria, Virginia 22320, United States of America. Tel. +1 (703) 548-1070. Pamela von Gruber, President and CEO, Argonaut Water, Inc., PO Box 320483, Alexandria, Virginia 22320, USA. Tel. +1 (703) 548-1070. Gregory Copley, c/o the International Strategic Studies Association, PO Box 320608, Alexandria, Virginia 22320, United States of America. Tel. +1 (703) 548-1070. Cell: +1 (703) 909-4167.